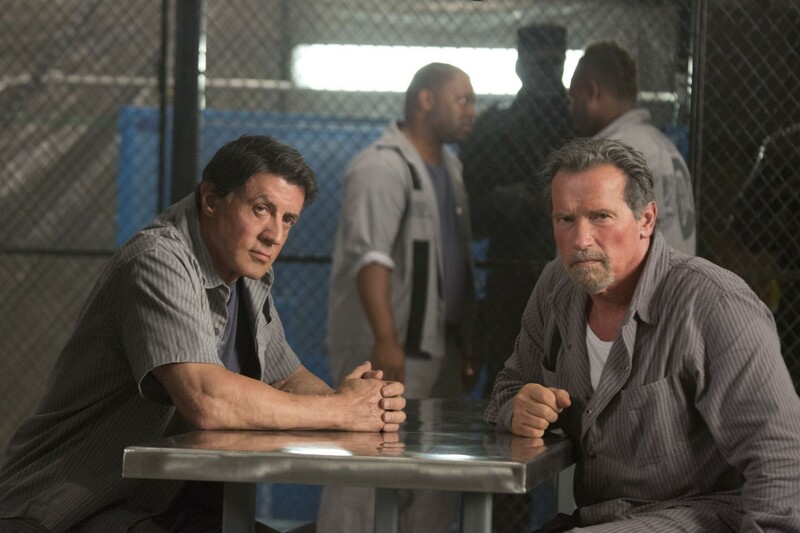 My guess is that Sylvester Stallone and Arnold Schwarzenegger had way more fun acting together than they thought they would in the two “Expendables” movies. In the first “Expendables” Stallone and Schwarzenegger shared the screen (along with Bruce Willis) for maybe two or three minutes. 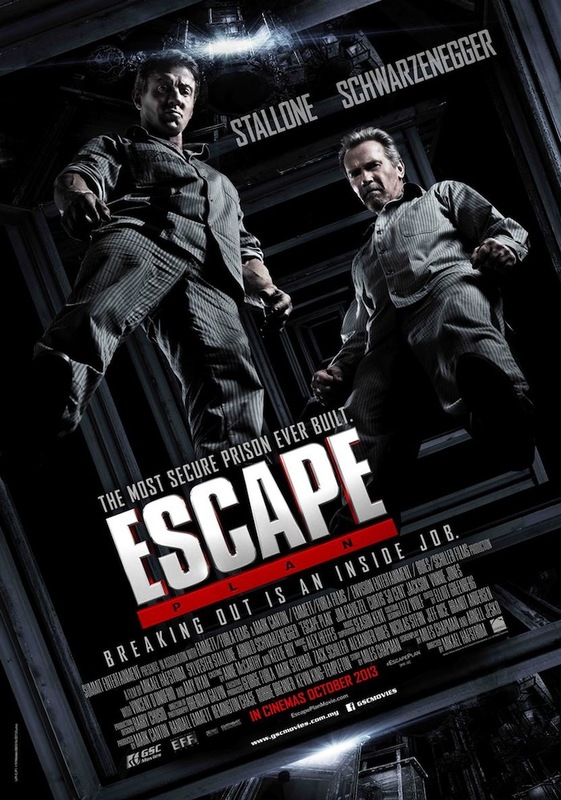 “The Expendables 2” gave Stallone and Schwarzenegger more screen time together but ESCAPE PLAN has them truly co-starring for the first time in an action movie together. And let’s be honest, seeing two of the greatest and most successful action stars of the 80’s in a movie together is the drawing power of this movie. What surprised me is that there also was a damn good story to go along with the pairing of Stallone and Schwarzenegger with Ah-nuld doing some really good acting. Ray Breslin (Sylvester Stallone) is partnered with Lester Clark (Vincent D’Onofrio) in a highly unusual security firm. Ray is an absolute genius at breaking out of maximum security prisons. To date he’s broken out of 14. The goal is to show where the weaknesses in the prison security are so that they can be corrected. Ray is offered an obscene amount of money by the CIA to test a top secret corporately funded prison. The Tomb is an experiment in escape proof prisons. The location is secret and unlike most prisons, since it’s run by a for-profit corporation, if you have enough money to pay them to keep somebody you don’t like locked up for as long as you like, it’s all good. However, Ray still believes he can break out, using his method of Layout/Routine/Help. But the help this time comes in the hulking form of a fellow prisoner, Emil Rottmayer (Arnold Schwarzenegger) who joins up with Ray. He’ll use his resources in The Tomb to help Ray and in return, when Ray breaks out, he’ll take Rottmayer with him. Having spent an obscene amount of time during the 1980’s going to see their movies, I was delighted to see Stallone and Schwarzenegger back in action yet again. Yeah, yeah, I know that they’re older…but so am I. The screenplay affords them the opportunity to use their brains and wits more than they did in their past movies. If this had been made during the 80’s, Stallone and Schwarzenegger would simply have beat the hell out of everybody and walked out of the prison. The surprising thing here is that Schwarzenegger walks away with the acting honors as he’s the comedy relief in this movie. I estimate he’s got 65% of the funny lines in the movie and it’s truly amusing to watch him and Stallone as a musclebound Crosby/Hope pairing. He also has a great scene where he has to provide a distraction for his partner and goes into a religious rant spoken entirely in German. And he proves that he’s still got it in the action scenes. There’s a part where he finally gets his hand on a heavy machine gun and the audience in the theater just about went nuts because we all knew what was coming next. Almost as good is Faran Tahir as Javed, the leader of the prison’s Muslim population who joins up with Ray and Rottmayer. The way the relationship between him and Rottmayer is really interesting to watch and it’s always a bonus to see a Muslim character in this type of movie depicted as a man of respect, devout faith and intelligence. Stallone plays a more cerebral character than we’re used to him seeing and I liked how his smarts was displayed. When Ray is explaining how he’s going to execute his plans and breaks it down step by step, it’s jaw-droppingly good the way director Mikael Hafstrom uses CGI diagrams and floor plans to help explain. 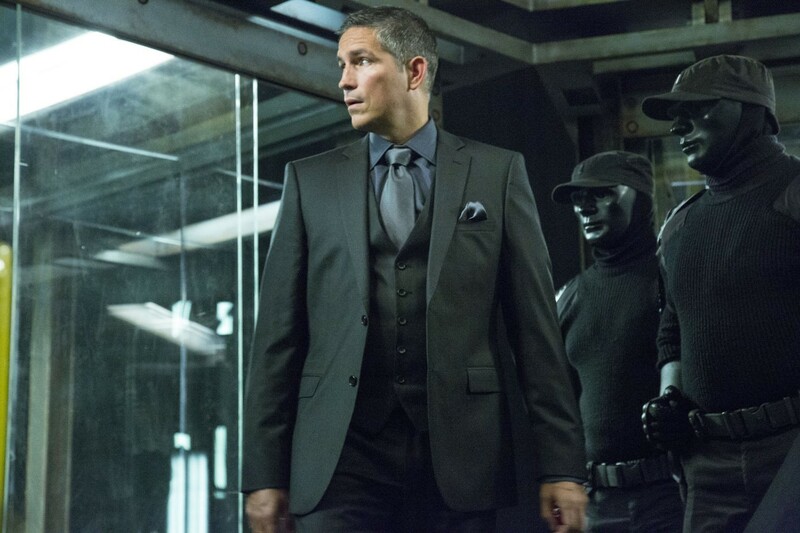 Jim Caviezel is nothing less than amazing and if you like him playing a good guy on TV’s “Person of Interest” then you’re going to enjoy even more seeing him play a bad guy. He’s the best kind of bad guy: the one who doesn’t have to raise his voice because he has no doubt he’s in control. Vinnie Jones as his chief enforcer/guard does his usual barking-mad-foaming-at-the-mouth badass. 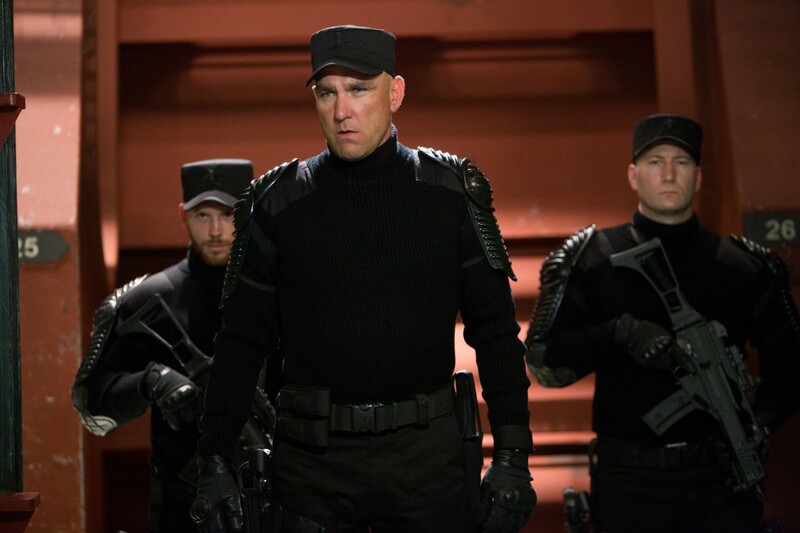 Nothing special here but Vinnie Jones has got this type of role locked down so well it should have his copyright on it. Wish I could say more about Amy Ryan and Curtis “50 Cent” Jackson but the truth of the matter is that they really don’t have much to do other than yell at Lester about why isn’t he doing anything to find Ray. Sam Neill picks up a neat paycheck for playing The Tomb’s doctor. I hate to see an actor of Sam Neill’s talent wasted and he’s here in this movie for one reason and one reason only: to send an email. So should you see ESCAPE PLAN? If you’re a fan of 80’s action movies and want to watch a movie that’s a throwback to that decade, Yes. If you’re a fan of Sylvester Stallone and Arnold Schwarzenegger, Yes. If you want to watch a decent action thriller that’s a little bit smarter and better acted than it needed to be, Yes. Rated R: For violence and language. The “F” bomb must have been dropped about fifty times in this movie so if you’ve got sensitive ears, don’t say I didn’t warn you. Went in one afternoon not expecting much and came out surprised at how much, as a piece of popcorn fluff, I had enjoyed it. But I think there were elements that could have been improved; namely the action scenes which were functional without being showy for two actors used to over the top showy. 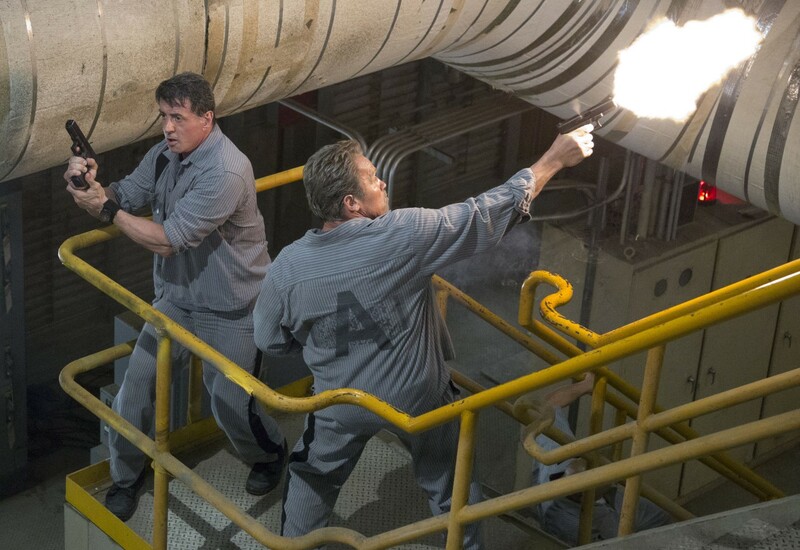 I really enjoyed watching the movie….arnold and stallone’s acting was superb. It was a fun experience to see them both in a good quality film.